Back in October of 2014, I ordered a couple of air chucks to experiment with so that I could make up a 4 wheel tire inflator/deflator. The air chucks had been sitting in the top drawer of my toolbox until now. I got busy on the project once again and finally up the 4 tire deflator/inflator. These are the stay-on air chucks that I ordered. The one on the left with the lever is quite nice but it is just not as secure as the one on the right. The one with the lever has just a single clip and the one with the pull back collar has two clips and fits more securely. The one on the right also pushes onto the valve stem easily and you don’t need to pull the collar back to do this. So fast forward from 2014 to earlier this week (May 2018) when I ordered the rest of the parts. I had been planning all along to use quality components. While you can order one long hose and cut it to fit using fittings and hose clamps for less money, I wanted a more “finished” quality to finished product so I ordered pre-made Goodyear hoses with a 10 year warranty. I also used a digital tire pressure gauge with backlight and rugged outer case. Rather than using the blocky brass fittings, I found smaller, more rounded fittings. The Goodyear hoses are available in yellow, red or black. I picked yellow so that they are as visible as possible on the trail. Everything coils up nicely and is just a little bit larger than a single 50 ft. air hose that you would be carrying anyway. The lengths work perfectly and all hoses are equal length. For my driveway beta test, I took the tire pressure down to 7 or so PSI just like I do on the trail. Air down was damn quick but I did not time this first try. Seems like it took about the same amount of time as it usually takes to deflate 1 to 1-1/2 tires. 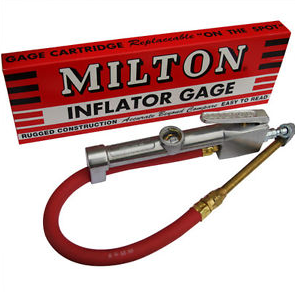 The pressure gauge will go to zero while you are deflating even though you are not at zero yet. Once you hit zero, close the valve off every so often to check where you are. I took it down to 7.5psi today at all for corners. Air up took about 18 minutes using the ARB twin pump under the passenger seat. This was for airing up 4 37” tires from 7psi to 32psi – just like I do at the end of the trail. FWIW, this test was done at my house which is barely above sea level. 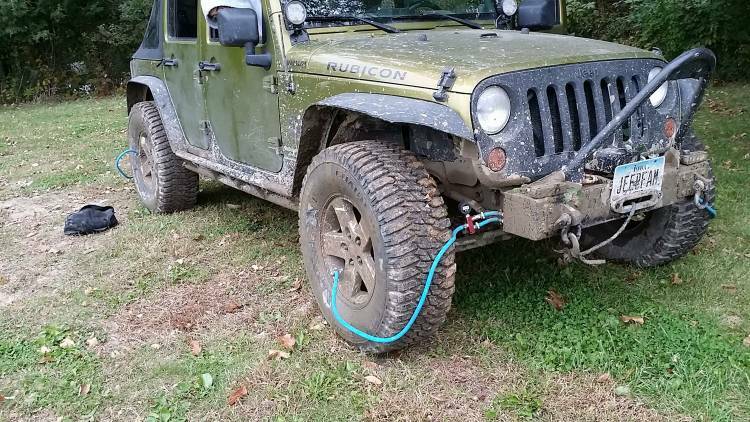 With the TPMS system on my Rubicon, I was able to watch all four tires inflate real-time. Pretty cool. The pressure gauge reads about 1psi higher than the actual tire pressure while you are pumping up. Shut the valve to see the correct pressure. Thanks for sharing your ingenuity! Thanks, man. I'm as happy to share the idea as I am to have implement it. Can't wait to try it at trailhead. Please respond back to the thread if you fabbed one up yourself regardless of how you did it. I absolutely will when I do my own. Great design... I can't see any reason why it wouldn't work with a C02 setup either. Any thoughts on that? 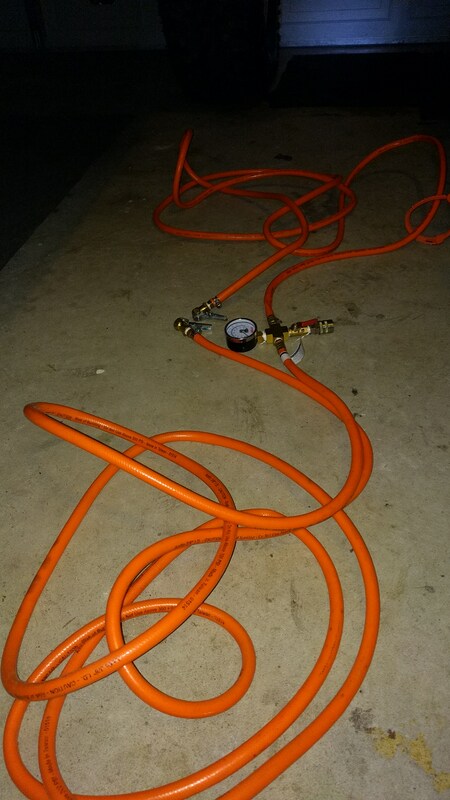 I have this one as well that I use for my 20' set of 4 gauge jumper cables but I think it is a tad too small for the hoses. Paul, very cool idea and great write-up! It woudl be cool to add a "set" mode regulator that would kick off the compressor once the pressure has been reached\equalized. 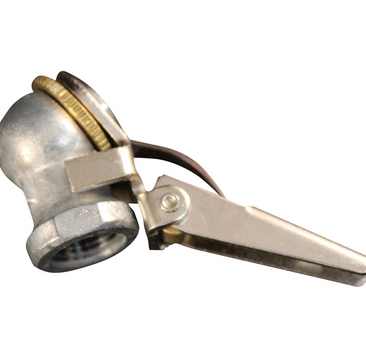 Barksdale Series CSP Compact Pressure Switch, Single Setpoint, 5 to 30 PSI, CSP12-32-13B - FLW, Inc.
basically add on in line with the electric lines setup to power the compressor\ARB. Once it reached the desired pressure the compressor switches off. I had been noodling over including a pressure switch for some time. Had another thread on it somewhere here. So far, though, I am thinking that it may not be worth the extra hassle. On air up with the pump running and the valve open, the gauge is reading real time and only reads about 1psi to 1.5psi above what it will read when the valve is shut. I like to run my tires at 32psi cold all around. It has been my experience so far that just keeping an eye on the gauge and shutting the valve as soon as you see 33.5psi just works and the end result is the target 32psi. Actually, I add a psi or two to my target psi at air up when leaving the trail because I am normally up at altitude when I do that and drive home to ~300' or so above sea level. Rubicon and Slick Rock are around 7,000' or so. You are welcome to try this out yourself sans regulator next time we are out on the trail - after I air mine up, of course. Actually, I add a psi or two to my target psi at air up when leaving the trail because I am normally up at altitude when I do that and drive home to ~300' or so above sea level. I air up to 30.5 psi to get 28 psi cold (due to filling a tire with hot air which cools and contracts) if not changing elevation. 7000' elevation drops ~3.4 PSI from sea level (atmospheric pressure = 14.7 psi @ sea level, 11.3 psi @ 7000'). If I'm airing up then "getting good gas mileage" (driving downhill ) for a few hours, I'll put in 35 psi and fuggedaboudit. Just a couple of pics here of the storage bag. It's a perfect fit but you have to figure out how to roll it up perfectly. It holds air quite well too and it works on one tire too when you connect just one hose. It's time to QA test this on the trail! while nowhere near as fancy as yours , I was inspired enough by this thread to go get some extra air hose from my garage & other air parts I had to make a 2 tire refill / balance air psi between the two . It is avhalf assed effort but can air up two tires at once or borrow 12psi from a full tire to the empty spare...it seemed like I was gonna wind up with a lot more hosecthan you have if I, too, built for all four. Cool man. Two works as well. But I've moved on. I'm wiring in a hood sensor to the factory alarm today. Thinking to add a proximity sensor too for when the doors are off. I'm also trying to figure out the horn button wiring so that I can bypass the TIPM and have a fast acting horn. Picked up a Stebel Nautalis. we must be on similar Jeep mindwaves; our upgrades seem to parallel one another’s several times lately ,anyway...(I’ve gone thru it w Ken ( kjeeper) before, too). I have browser history from past week that has tons of alt horn for the JK options data and info. Those Nautilus are one of the best, loudest possible. I have been lookin at the super low frequency horns.i like 330hz PIAA as just a sonic improvement . I don’t wanna add a second ,but it sounds better combined w. 440 or 550 Hz ..
I’m used to the delay we all loath w the horn by now but yours would address that w it’s own harness ,for sure. Nice writeup. I have a similar setup for air up/down. The nice thing about airing up all 4 at once, is that all 4 tires will be exactly the psi. I have a York compressor and ran a hard line next to the frame from front to back and then quick disconnects at each corner. This way I am not laying a hose on the ground in the Iowa mud 4- 4ft hoses with the same clip on/stay on tire valves. I air all 4 tires in 3 minutes total. Yeah, I like the nautilus. The stock dual horn on my 2013 wasn't completely terrible. The reason I am relocating it is because the horn over by the master cylinder is getting displaced by a clutch master cylinder reservoir and the larger brake booster and m/c. 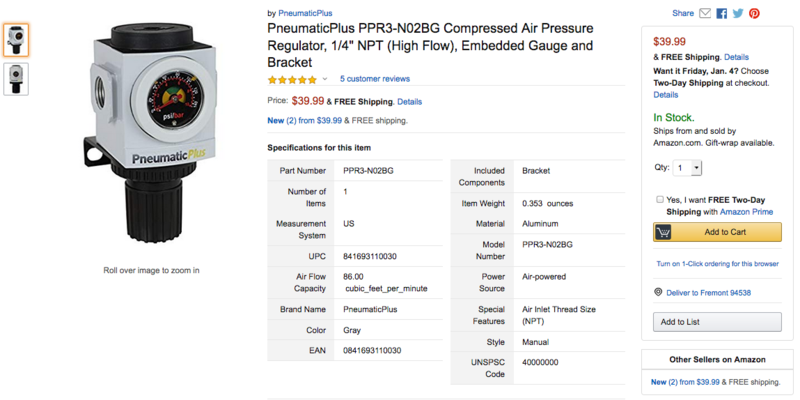 Do you have a part number for those lock on air chucks? Do they work well? I'm using these because they grip from two sides versus one as shown in the pics above. i like that they are shorter too. I need a chuck that is 90 degrees from the hose. The one I linked to is the one I ended up using. It is pretty short and lower profile than the other so you might be able to use a male-female elbow on it if you need to. I was using them on my trailreadys (now sold - can't take new pics) without issue and that valve stem had to be tilted out a little so I could slide the chuck on there easier. The one I linked to screws right on to the hose.